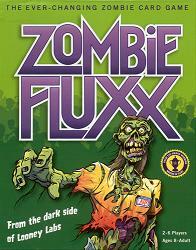 Zombie Fluxx takes the award-winning card game Fluxx and cranks up the fun with a Zombie uprising. The Zombies arrive in the form of a new type of card, called the Creeper, which hangs around in front of you, preventing you from winning. The good news is, the Keepers include a Shotgun and a Chainsaw and various other things you can use as weapons against the Zombies. Plus you`ve got Sandwiches and Coffee and a couple of Friends to help you win. The bad news is, if your Friends become Zombies, you`ll have to destroy them. Welcome to the dark side of Fluxx, the card game of ever-changing rules!